So, is it French Country or Country French? Do you know? Is there a difference? I mean, I don’t want to be going around saying the wrong thing! It would be like all those years I was singing along to certain Aerosmith songs and didn’t know (or understand) the lyrics until one day it was pointed out to me that I had been singing them wrong. Yesterday I shared with you how I made my peace with burlap when I added this Burlap Vanity Skirt to our downstairs bathroom. And now I’m thrilled to be sharing with you the rest of this space. It’s come a long way! Wallpaper in a small, dark room like this can have such a dramatic impact. Unless it’s ugly. Then it’s dramatic for all the wrong reasons. This room had very ugly wallpaper in it when we first moved in. When we attempted to take it down, we realized that it had been attached to walls which had never been properly finished and the walls started peeling right along with the ugly wallpaper. It wasn’t in our budget to have someone come in and re-finish the walls so we did the next best thing. Put up more wallpaper! I love my yellow damask wallpaper. I know it’s not for everyone but everyone doesn’t live here. This leads me to my next question for you. 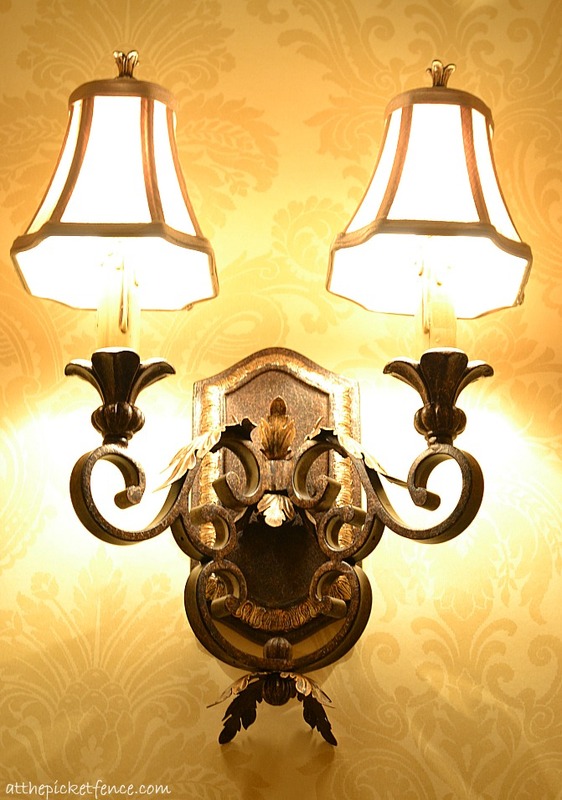 Do you say “damask” with the emphasis on the “da” or the “mask”? I never know so I tend to alternate between the two. Although if I alternate between the two within the same sentence the person I’m talking with will look at me like I’m a crazy person. Since my daughter still can’t quite reach the faucet a stool is a necessity in this bathroom. 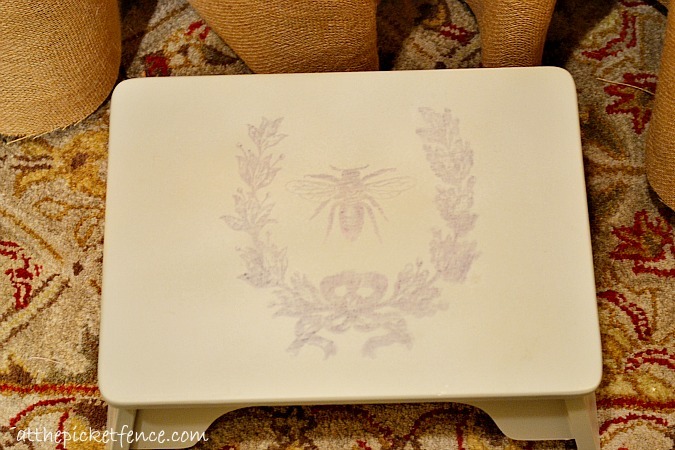 I gave a basic white wooden stool a makeover with paint and a darling graphic courtesy of The Graphics Fairy. Having a full bathroom downstairs is truly a blessing since we often have guests staying with us and the adjoining office often does double duty as a guest room. 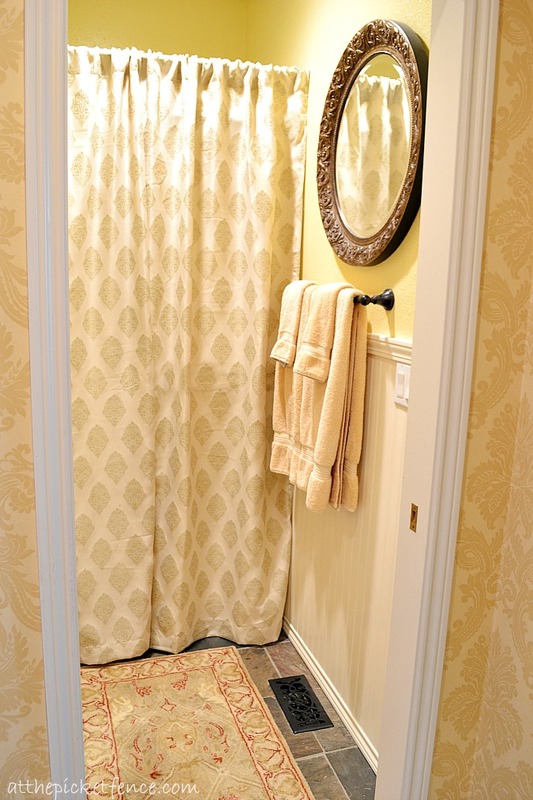 The bathroom also connects to a hallway off the family room in a “Jack and Jill” style. I can never find shower curtains that I really like so I always end up using regular curtains. These were yet another great TJ Maxx find! Oh wait! 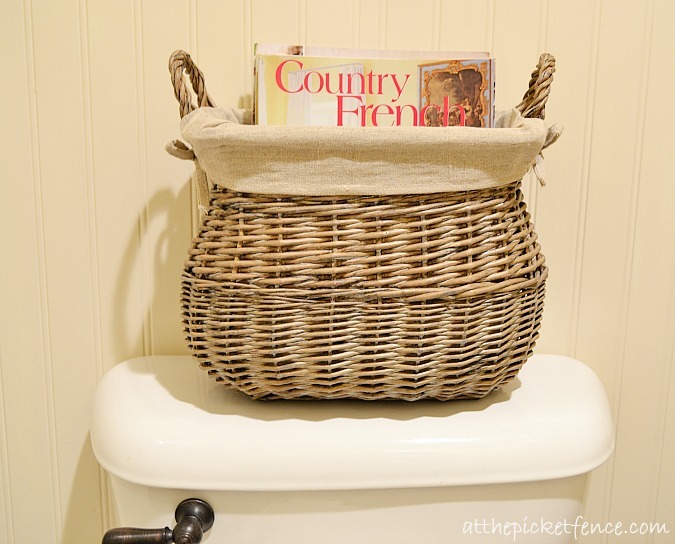 See that magazine peeking out from the basket?? Does that answer my first question? I mean, this is my most favorite magazine so shouldn’t I go by what it says? Now, I’m even more confused! Oh well, I guess it really doesn’t matter whether it’s Country French or French Country, right? I mean, when I look back at how far this bathroom has come all that matters is that it doesn’t look like this anymore! This is the only Before picture I could find of this space. It was taken when we first toured the house. Can you see the reflection of the rest of the bathroom in the mirror? I guess whether it’s French Country or Country French isn’t that important after all. All that matters is that it is much improved and I LOVE it! 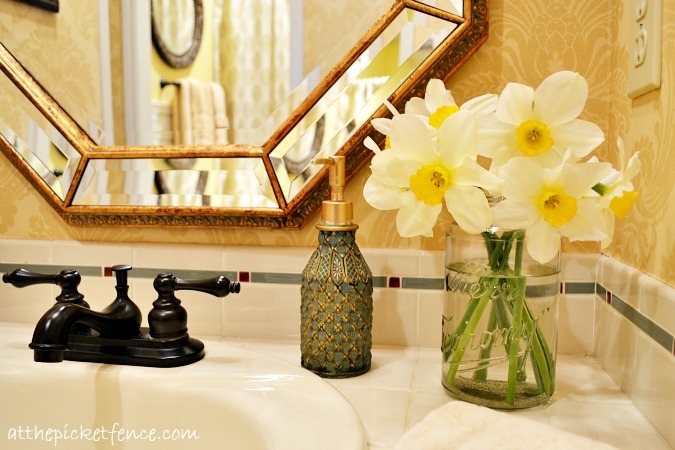 45 Comments on "French Country Bathroom Makeover"
What a gorgeous bathroom! I have a half bath with wallpaper. I love it. It gives a nice look to a small space. Thanks for sharing. Vanessa, what a lovely bathroom. I love the wallpaper! French Country or Country French…it’s beautiful. That looks amazing! So bright and elegant. An amazing difference. it’s gorgeous, and I love all things damask. the burlap vanity skirt is perfect for this spot!, and don’t you want to wring the neck of whoever decided that sizing the bare walls wasn’t necessary? been there and done that! LOL! Yes, Debra I really did want to wring their necks! Especially when we discovered they had done the same thing to the kids’ bathroom. Ugh. 🙂 Thanks so much for coming by! 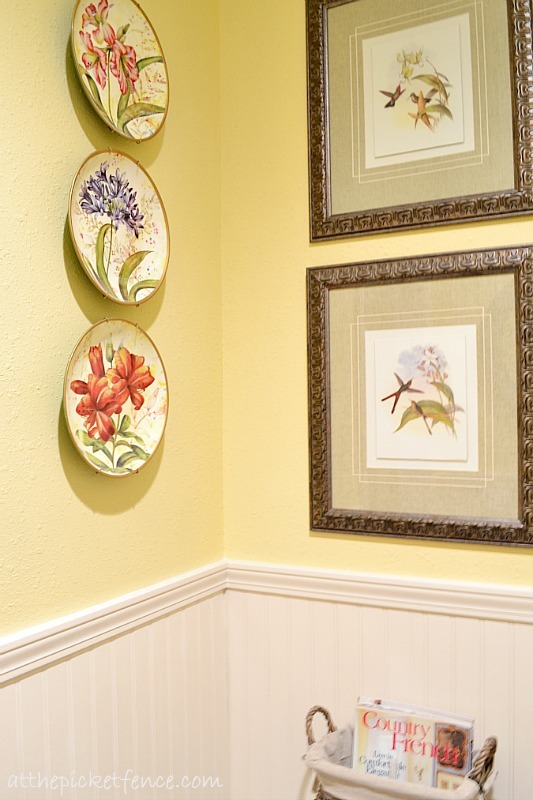 I have never been a “yellow” person but since we painted our kitchen that color I have been in love with it! It really makes a room feel happy and joyful. Great job! Vanessa, This is a fabulous transformation! I love the wallpaper and the burlap skirt is wonderful. 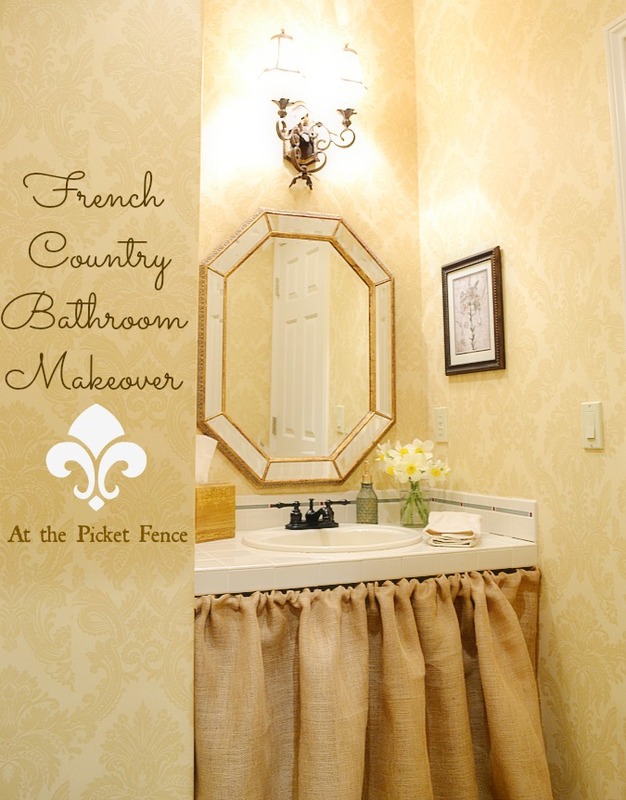 You can call your bath French Country or Country French…I call it BEAUTIFUL! I totally put the emphasis on the mask part of damask, but I have no idea if that’s right. Also, I really really hate damask and it gives me icky feelings for some reason. But I actually like it in yellow! What do you know? I learned something today! Anyway, your bathroom looks super! I say damask with the emphasis on the “da” only because that’s how they pronounced it on Desperate Housewives once! 🙂 I have no idea if that’s right. 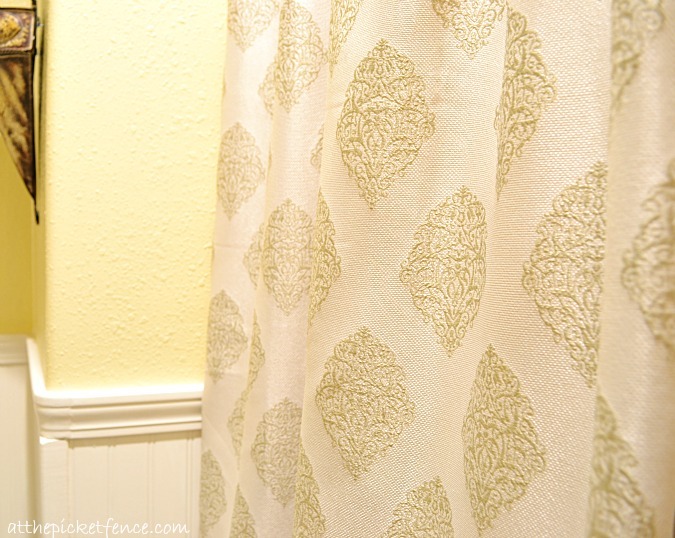 I love the bathroom and I especially like the idea of using curtains for a shower curtain. Lovely, lovely room! You really did a great job on your bathroom. It looks amazing! I wish my bathroom looked half this good. Your bathroom is absolutely gorgeous. Is it wallpaper or did you stencil the walls? Gorgeous colors and I am in love with your mirror. Awesome photography as well. I’m not sure if it’s Country French or French County. Your newly Country French inspired bathroom is truly beautiful, Vanessa. We have a powder room with wallpaper I so adored in the early eighties that has seen its duration. Hopefully, it will get an update before fall. It’s beautiful! I love every inch!! Your bathroom looks fabulous Vanessa! Love the wallpaper and your shower curtain. Really cute. I love the burlap! Love the walls too! Vanessa it turned out perfect! I never know what the difference is between French Country and Country French either! ;) Thanx for joining THT this week. Vanessa, I love your DAM-ask! It’s such a happy, sunshiny color, and that mirror is gorgeous, too! Now, do you say Pee-can or pe-cahn? LOL Jane! I alternate between those two pronunciations of pecan! Guess it depends on which part of the country I happen to be in at the time. 😉 Thanks so much for your sweet comment and for stopping by! It turned out beautiful. I also have a hard time with Country French or French Country.. I love your blog… A new follower for sure!! Vanessa…this bathroom is so beautiful…love everything about it, from the color to the lighting to the beautiful prints on the wall….Hey, I call myself Aerosmith lyric challenged too! Oh, my gosh, what a transformation. I absolutley love the yellow color palette. 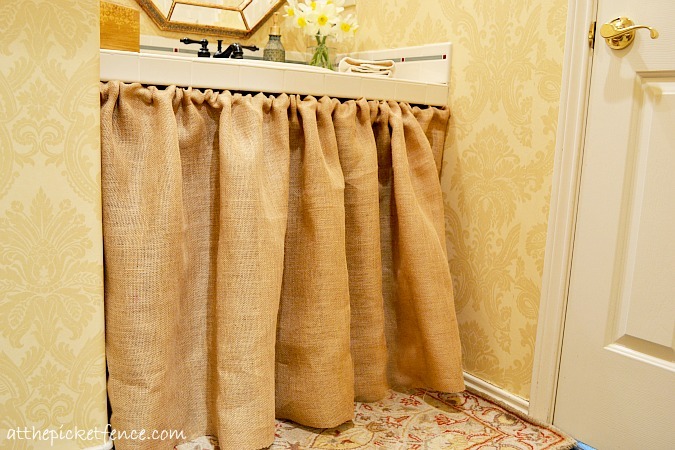 I have never really been a burlap person, but I your below the sink burlap curtain loos fabulous. 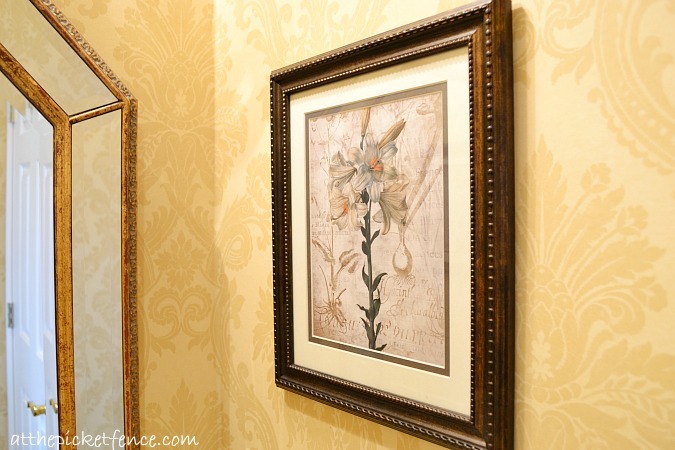 The damask wallpaper and the mirror were also excellent choices.. well done! your new wallpaper makes my heart sing! truly. sing. This is just lovely! I really like all the neutrals and muted tones. The pops of color in the artwork and accessories are just enough. It looks so very relaxing and soothing. Let me make it a little more confusing. My mother-in-law always called it “rural French”. Gorgeous! 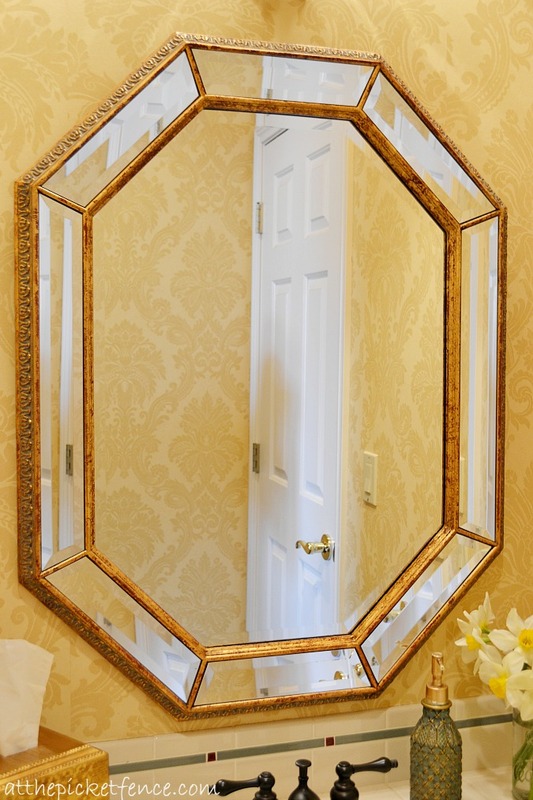 I love all of the beautiful details you added and that mirror really makes a beautiful focal point! Love the bathroom. Any chance you will share the source for the wallpaper? Get “The Scoop”…we’re guest hosting a party! 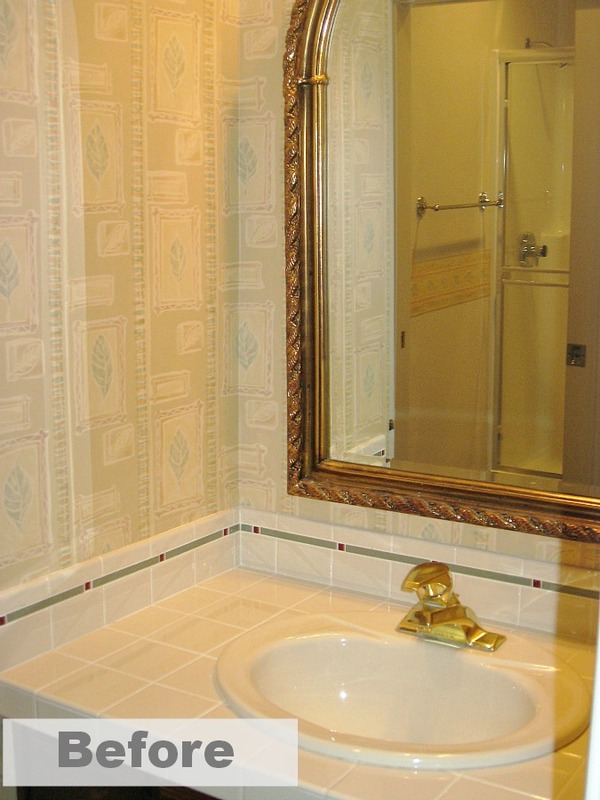 I am in the process of rewallpapering my small bathroom….and LOVE your wallpaper….what is the manufacturer and name of the paper!!! It’s just what I’m looking for….kind of a color on color but ADORABLE!!!! Great creativity in that mind of yours!!! I just love how you redecorated this bathroom. Everything matches really well. The yellow damask wallpaper really brings everything together.